In the 1960s, an artist by the name of David Schiller was producing a wealth of artwork for bands and the overall music scene. 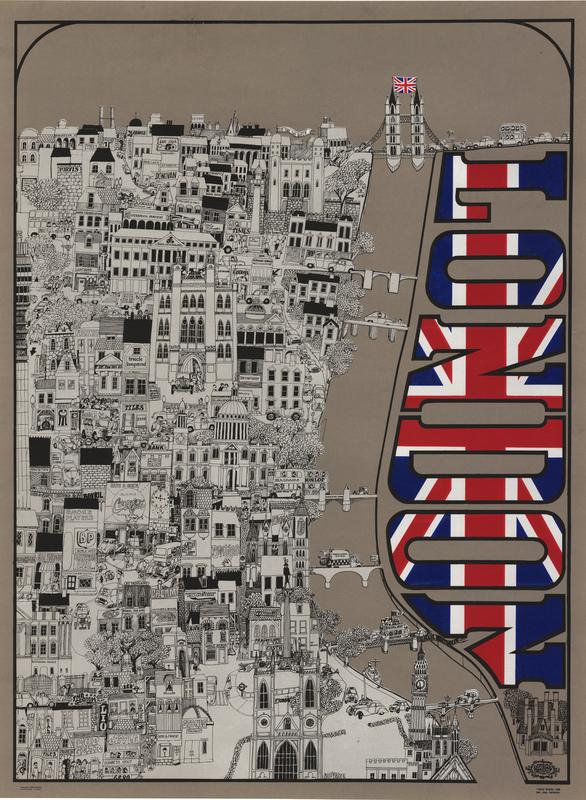 In 1968, he produced a run of pictorial bird's eye view posters for various cities and places which included London, New York, San Francisco, and the state of California. The color patterns, type font, and style he employed was unique for each piece. This is a scarce example of his map of London printed on linen. Much of his work can be found on paper as the paper examples was what were sold to the masses. These linen examples were likely made for stores (a lot of the time head shops) to hang as advertisements for the paper examples they sold, hence the linen example was produced in far fewer numbers. This pictorial style map of London presents the city in an eastward orientation with the River Thames just right of center, dividing the map and its unique title of London, depicted in block letters and filled in with the flag of the United Kingdom. Numerous bands are noted throughout, some of which include Jimi Hendrix, the Beatles, Cream, the Rolling Stones, the Who, Herman’s Hermits, the Animals, and the Dave Clark 5. Landmarks of historical, cultural, and artistic importance such as Apple Records, Sothebys, Buckingham Palace, Guild Hall, Savoy, and the Mad Hatter can also be found within the map. Condition: This linen backed poster is in A condition. 1680 Nieuwe Pascaert van de Ooft Cust Van Schotlandt Beginnende van Barwyck tot aen de Orcades Ylanden.